As The Smoky God (1908) was published late in the era of Hollow Earth stories, it has little to add in originality, but can be praised for its compact retelling of the most common themes and contemporary elements of the ‘science’ of hollow earth theories. It utilized the common ‘framing’ narrative, of the author passing on a second hand story that may defy belief, but at the same time strains credibility in providing evidence that the original narrator may not be completely mad. As the civilizations to be found underground are never humanity’s equals, being always lesser or greater, Willis George Emerson chose to (briefly) develop the latter. What is most intriguing about The Smoky God is the effort put into the verisimilitude for the benefit of the reader. There is an interesting dichotomy that exists between the ‘author’ and the ‘narrator’ in The Smoky God. From the outset, Emerson sets to distance himself from Olaf Jansen’s narrative, disclaiming any responsibility for this as his own wild tale, but at the same time, is the party responsible for also establishing the credit of the narrator for the reader. It is a two-fold approach, logos and ethos. Emerson builds up his scientific arguments with excerpts from the works of various explorers and hollow earth proponents of the day (among them William F. Warren, Sir John barrow and Robert E. Peary) while expounding upon Jansen as ‘no ordinary person, […] profound and learned to a remarkable degree’ (pg. 3). Considering how short the story is, one might question why so much space is given to introducing Jansen, and Emerson’s ‘relationship’ with him, until it becomes apparent that Emerson is attempting to establish the contemporary ‘facts’ about hollow earth theory, and the apparent ‘credibility’ of Jansen’s story. It is interesting how in one breath, Emerson states that Jansen’s story may be seen as that of a ‘distorted intellect superinduced, possibly, by the glamour of unveiling a marvelous mystery, rather than a truthful record of unparalleled experiences related by one Olaf Jansen, whose eloquent madness so appealed to my imagination that all thought of an analytical criticism has been effectually dispelled.’ (pg. 1) But in the next, Emerson muses that ‘A hundred times I have asked myself whether it is possible that the world’s geography is incomplete, and that the startling narrative of Olaf Jansen is predicated upon demonstrable facts.’ (pg. 1) As a good, honest narrator, though, Emerson also assures the reader that ‘My simple duty is to enlighten the world concerning a heretofore unknown portion of the universe, as it was seen and described by the old Norseman, Olaf Jansen.’ (pg. 1) In other words, the reader would not be out of line in possibly believing that the narrative is potentially true, but if the reader does not believe, well, Emerson should not be locked up as mentally deranged; it’s not his story, after all. 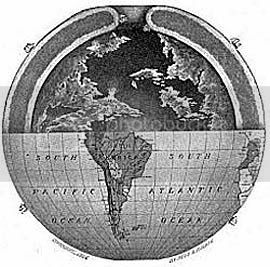 Nor is Emerson the first to muse about the possibilities of a hollow earth. Plato is the opening quote utilized by Emerson, placing God at the center of the earth, and noting a little later, ‘It may be that the true home of Apollo was not at Delphi, but in that older earth-center of which Plato speaks’ (pg. 1) As the ‘Smoky God’ is referring to the electric cloud at the earth’s core that provides illumination and is worshiped as a deity by the inner world inhabitants, Emerson draws parallels for this with real world religion: ‘Ancient Hindoo, Japanese and Chinese writings, as well as the hieroglyphics of the extinct races of the North American continent, all speak of the custom on sun-worshipping, and it is possible […] that the people of the inner world’ migrated to the surface of the Earth, spawning humanity (pg. 6). To back up the theory of a central origin for humans, Emerson’s first footnote quotes M. le Marquis G. de Saporta’s “How the Earth was Peopled, II” from 1883. This is the foundation for Emerson’s continued framing of the story utilizing contemporary texts to back-up Jansen’s tale. The character of Olaf Jansen himself is developed in some detail at the start of the second part, where he lays out his parents, his birth, rearing and education. He also explains away the long delay in his recounting of this story by his imprisonment in a mental ward for telling others what he found on his voyage. This mark of ‘innocent insanity’ is meant to foster sympathy from the reader, in the likes of Pandora never being believed. Jansen’s ‘deathbed confession’ is also apparently used to foster sympathy, as a dying man would never lie with his last breaths. Jansen is careful to rebuild his character, though, as that of an upstanding and successful citizen once he was released, lending further weight to the veracity of his tale. As Emerson states in the beginning, ‘truth is stranger than fiction’, so maybe, just maybe, the reader should invest a little belief in the story. The voyage itself does not begin until almost a third of the way into the book, and the geography is carefully laid out; another attempt to provide verisimilitude, a map that the reader is capable of following. Jansen/Emerson is clear about the factors which made this voyage possible, from motivations both economic (the quests for ivory) and spiritual (the quest for the realm of Odin and Thor) to the size of the fishing boat (‘had our craft been other than small, we never could have gotten through’ – pg. 11). This establishment of the difficulty of the voyage is meant to lend credence as to why no other explorer has completed this voyage before. However, there is heavy citation of the observations of contemporary polar explorers, including ‘the dipping of the needle’ on the compass (pg. 12), the presence of fresh water (pg. 11), and the unmoving Pole Star. The arrival of Jansen and his father to the Inner World is where Emerson’s imagination takes full hold. This imagination, however, is limited to merely making the features of the Inner World of immense size; the inhabitants, the rivers, the flora and fauna. In a way, this has a normalizing effect upon the text. Elephants and tortoises are readily identifiable, as are the grapes ‘large as an orange’ and the apples ‘larger than a man’s head’ (pg. 18). Size is a matter of status; these things which are larger must surely be superior to those things found on the surface of the earth. The size of the people of the Inner World is also meant to stand them in the eyes of readers as a superior to homo sapiens. The inhabitants are an unnamed species, but other than their large appearance, Emerson has not distanced them far from humanity. They are ‘of gigantic stature’, have ‘full beards’, and ‘mild and beautiful faces, exceedingly fair, with ruddy complexions’ (pg. 16). As a refined, advanced race, these inhabitants demonstrate an ‘ease of manner which we deem a sign of good breeding’ (pg. 17) and throw around gold as a common metal, used for decoration rather than finance. In fact, Emerson/Jensen makes no notation about the economy of the Inner World, as if capitalism is beneath so refined a race. They are credited with speaking a form of Sanskrit (pg. 19) which is an indicator of how ancient this civilization is intended to be, Sanskrit being one of the oldest know languages when Emerson was writing. One must wonder if it was a slip of the pen when Emerson credits this civilization with a remarkable gift in the arts and sciences, including astronomy (pg. 20) – no indications of what form this ‘astronomy’ form the inside of the earth might take. The technology of the Inner World is demonstrated without much explanation beyond the use of electricity, an advancement that was spreading in the Western world, though this fictional civilization is not dominated by their technology. This is still a pastoral society dedicated to agriculture and art, as demonstrated by the ‘temples of music’ (pg. 18) and the hillsides of vineyards and valleys of grain (pg. 18). There is a rather long passage on page 19 explaining the ‘monorail’ transport the characters use, with a science so muddled in inconsistency as to baffle the modern reader. The use of fly wheels, and the destruction of air pressure/gravity (as if the two were actually related) somehow relates to the high rate of speed at which the monorail car travels. This is the only instance, however, when Emerson attempts to delve into any sort of early SF ‘technobable’, choosing instead to focus on the nature of the Inner World. A single sentence also states that ‘they hold communication with one another between the most distant parts of the country, on air currents’ (pg. 21) a very early reference to the development of radio and telephones which were still much the marvel in 1908. Despite the seeming advancement of this Inner World race, they still possess a ‘pagan’ religion of sun worship, of the electric cloud that emanates light for twelve hours of day, and is eclipsed for 12 hours of night, the ‘Smoky God’, the ‘throne of their Jehovah’ (pg. 18). There is mention of a High Priest residing in a city called ‘Eden’ (pg. 19), though it is debatable whether Emerson was incapable of imagining a world free of these biblical references, or if he was attempting to utilize a language his readers would recognize. The rivers Euphrates, Pison, Gihon and Hiddekel are mentioned as emanating from this City of Eden, just as they did from the biblical Garden of Eden, further tying the narrative into western religious tradition and relying on those traditions to add credence to the plausibility of the tale. The longevity of the Inner World beings (six to eight hundred years) is indicative both of their superiority and harkens the reader back to the biblical references of Lazarus and the long lives of Old Testament figures. Emerson is mildly defensive of his biblical references at one point, when he mentions the gigantic trees, and how if ‘the Bible said there were trees towering over three hundred feet in height and over thirty feet in diameter, growing in the Garden of Eden, the Ingersolls, the Tom Paines and Voltaires would doubtless have pronounces the statement a myth. Yet this is the description of the California sequoia gigantea’ (pg. 20). So if such large trees can be found on the western coast of America, maybe thousand foot tall trees at the centre of the earth is not such a far off statement for the faithful? Rather abruptly, though, this exploration ends and the Jensens decide to leave. The voyage back to the ‘Outer World’ is as harrowing as the voyage in, this time exiting from the South Pole Symme’s Hole. Olaf Jensen is the only survivor, plucked from the ice by a passing whaling ship, and the narrative comes full circle to where Jensen was introduced. In part six, Jensen offers his concluding thoughts, which include another push for credibility: ‘I wish to state that I firmly believe science is yet in its infancy concerning the cosmology of the earth. There is so much that is unaccounted for by the world’s accepted knowledge of to-day’ (pg. 26). For contemporary readers, this would have been a difficult statement with which to disagree. He makes mention of S.A. Andree’s balloon expedition to the North Pole, speculating that he and his missing companions are merely being entertained by the Inner World – in truth, their bodies would be found in 1930. Emerson’s Afterword finishes off the framing with the assertion that ‘the original text has neither been added nor taken away from’ and that ‘It is impossible to express my opinion as to the value or reliability of the wonderful statements made by Olaf Jansen’ (pg. 28). The narrative seems to be more concerned with relaying a large amount of information regarding the possibilities of the hollow earth and arctic explorers, than Emerson actually attempting to develop Olaf Jensen as a character. Though I would not be the first to call this story without literary merit, it is an interesting summation of contemporary ideas and styles regarding the hollow earth.